These electrodes are designed for use in Beckman Series Three Chambers. All units have been engineered as improved replacements using the same configurations as the original equipment. 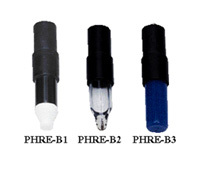 The “reference” electrodes are suitable for low to high temperature service from 0 to 14 pH and the reference design features the Porous PTFE liquid junction.